Keep in mind yesterday it jumped from the 72 range into the 77 cent range a 5 cent Swing per share. Market opens in the next hour, get this symbol on your Trading Screen b4 it sees Additional Price Swings. Lithium is currently a super juicy sector, with more top brand automobile manufacturers going towards battery / electric driven Cars. But that is just the start... this extremely valuable element ( Lithium ) is going into gear. Let's think about it for a second, we have seen Tesla make mind blowing market gains. Jumping from under $50 a share to over $350 a share. 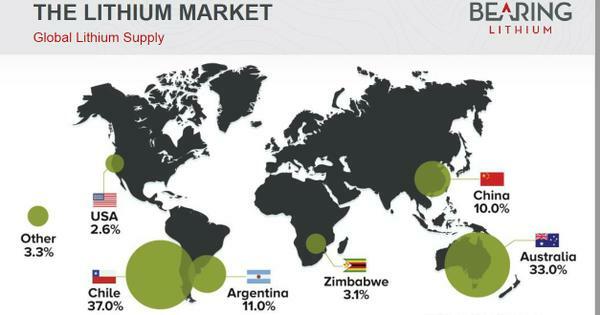 Can we assume it is safe to say, Lithium is in HIGH DEMAND!! How does BRGRF dominate the competition? They entered into a definitive agreement to acquire Li3 Energy who's primary asset is an 17.7pct interest in the Maricunga lithium project in Chile. What makes BRGRF such a undiscovered gem? The Maricunga Project is the highest grade, undeveloped lithium salar in the Americas. Actually it is only second in grade to the Salar De Atacama, which accounts for 100pct of Chile's lithium production and about 40pct of the global production, which is MASSIVE!! Over 30mil USD has been invested in this impressive project to date, which has generated a head turning NI 43-101 Measured Resource of 1.7 Mt LCE and Inferred Resource if 0.4 Mt LCE at an average grades of 1,160 mg/L Li. To spice things up even more, POSCO, one of the world's largest steel manufacturers, has invested 18m USD into Li3, who has developed proprietary lithium extraction technology that recovered over 80pct of lithium under 24 hours with a very small environmental footprint. BRGRF is at the right place at the right time!!! Intelligent investors jumped on opportunities like Tesla before they even made a market Impression… now it is our opportunity to take advantage of the mineral that is going to make the next major wave in the economy. Get Ready This is one of those companies you want on your Side.